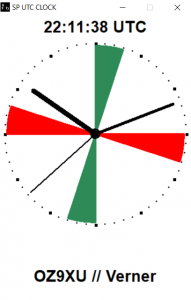 Maritime Radio Silent Period Clock for your Windows PC. A small application for any (?) Windows platforms displaying a Maritime Silent Period UTC Clock. Can be set up in different colors and layouts. Install: After download open the zip-file and COPY ALL the files to a new ordinary folder anywhere on your PC (name the folder as you like), and be sure that all files are in the same folder. Run the OPTION application and setup the clock, then save and exit. Adding shortcuts will make it easier. 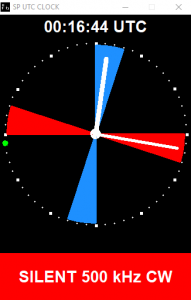 If you change the setup while the clock is running, changes will be effictive after re-starting the clock application.